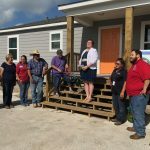 SOUTH TEXAS – The Coastal Bend Disaster Recovery Group (CBDRG) announced it has received a $1.17 million grant from Samaritan’s Purse to rebuild 15 homes in the Coastal Bend. CBDRG is a collaborative network comprised of non-profit, faith based and government organizations working as long-term recovery partners to assist the community with disaster recovery efforts following Hurricane Harvey. CBDRG has principally been involved in disaster case management and providing major permanent repairs, new manufactured home replacement and complete rebuild of homes for low-income, vulnerable homeowners whose homes were severely damaged by Hurricane Harvey. The funds provided by Samaritan’s Purse, an international Christian relief organization, will be used to completely rebuild 15 homes in Aransas Pass, Fulton, Gregory, Port Aransas, Rockport and Woodsboro. This includes demolition of the damaged residence and full reconstruction of the home from the ground up. With the help of CBDRG and other organizations, Samaritan’s Purse plans to rebuild or repair more than 450 homes for families who are unable to do the work on their own, including widows, elderly, uninsured and others with special needs.